Discover the Costa Acentejo Protected Landscape in North Tenerife. 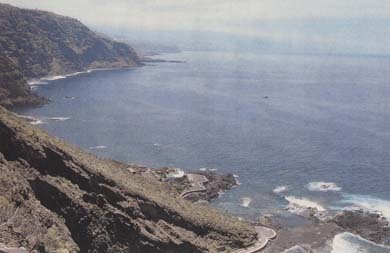 The Costa de Acentejo Protected Landscape is located on the north of Tenerife on the municipalities of Tacoronte, El Sauzal, La Matanza, Victoria, Santa Úrsula y La Orotava. This site has approximately 401 hectares, which extend through the north slope of Tenerife starting in La Matanza and heading to Ancón Beach, through municipalities like La Victoria. This protected landscape has exceptional beauty and it holds great scientific relevance as it shelters many protected flora and fauna species. Regarding its flora its mostly constituted by tabaibas and on the higher slopes you might see some rock flora. From its avifauna we highlight the presence of the Petrel de Bulwer Bulweria bulweri and the Puffinus assimilis, which usually nest on the Ancón Beach and Santa Ana Beach.